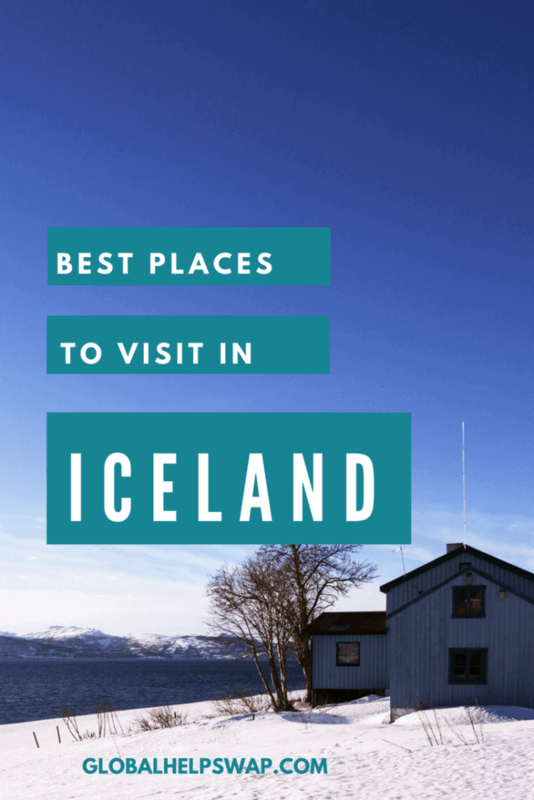 We visited Iceland last April and the place soon became our most favourite in Europe. It’s a bold statement but hopefully this post will explain why. Although at the same time we could never live there! We would never handle the darkness during the winter months. 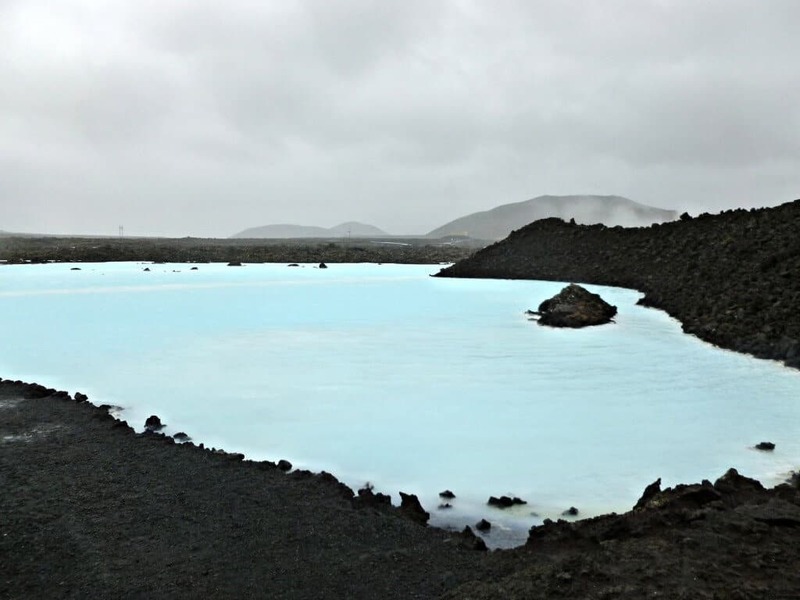 Iceland has been my number 1 destination to visit in Europe for a while because from the photos and videos I have seen it looks so otherworldly. 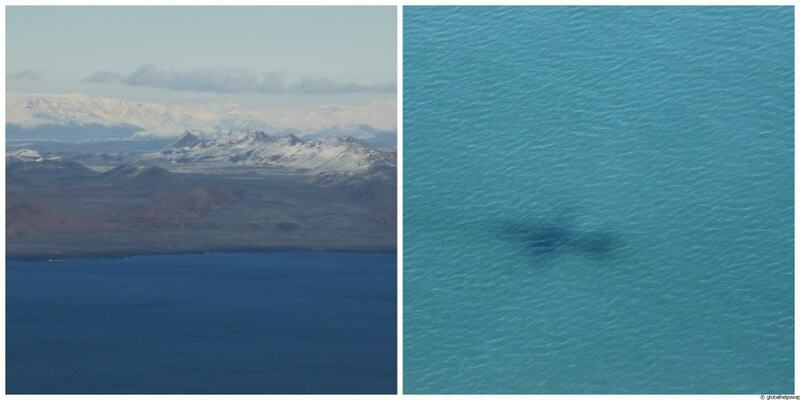 The flight time from London is just under 3 hours and as you come in to land, you can see how spectacular Iceland is. It was hard to believe that we were in the same continent. From my window seat on the plane I could see volcanoes, snow-capped mountains and beautiful blue seas. I could not wait to get out there and explore! Just before I list our things to do, I must mention the wonderful Icelandic people. It was so refreshing to be in Europe and meet smiling, happy and helpful people. Wherever we went we struck up conversations with people. The Icelandics share my kind of humour too. The mayor of Reykjavik decided to meet the mayor of Berlin dressed as Obi won Kenobi! Just because he can. Now that’s my kind of mayor: A Jedi! 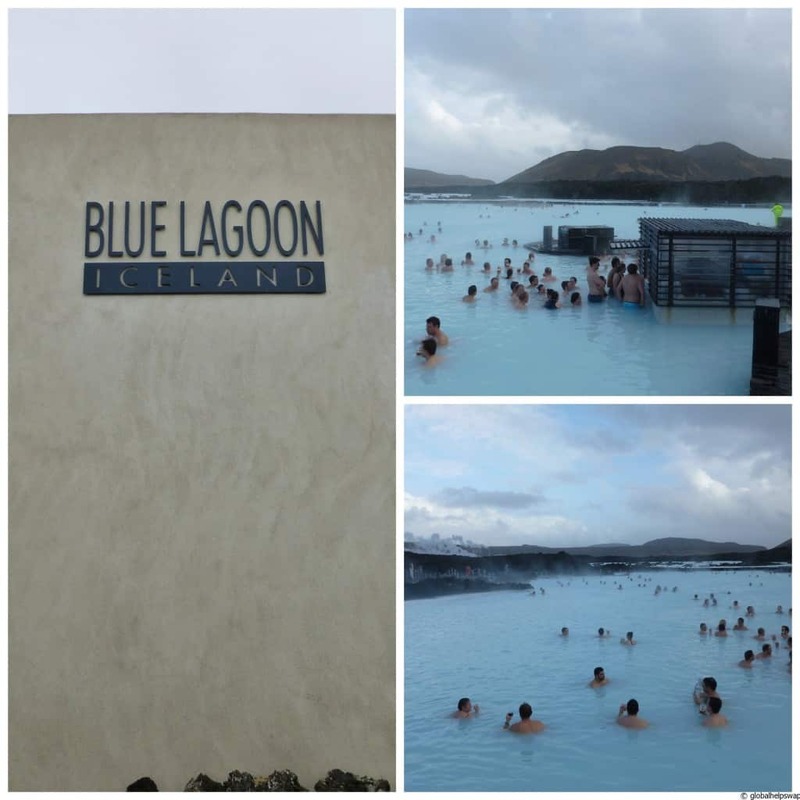 What can I say about The Blue Lagoon apart from the fact that once you get in, you never want to get out. We chose the perfect day to go too as it was quite cold and blustery. 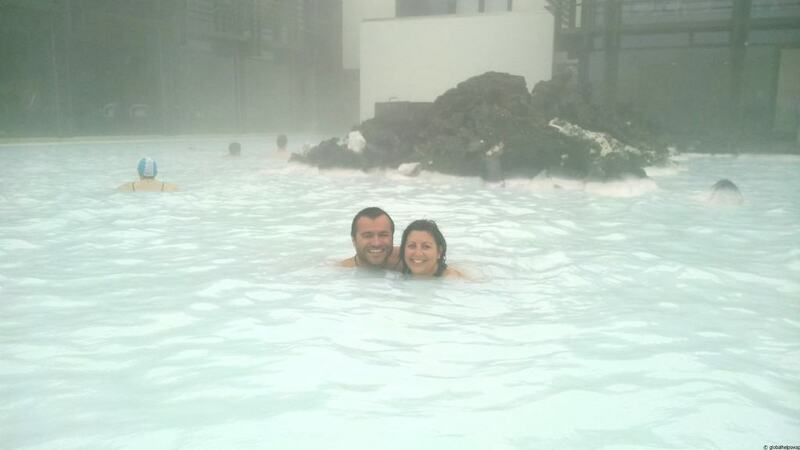 The lagoon itself is a geothermal spa which sits in a lava field not too far from Reykjavik. Not surprisingly it’s one of Iceland’s most visited attractions but the lagoon is so big it never felt crowded when we were there. The warm waters of the lagoon are rich in minerals. You can actually smother your face with the silica that lie in tubs around the edges. The waters and minerals are reputed to help with skin diseases such as psoriasis. All I know is that we were ultra relaxed after we left! As the Lagoon is half way in between the airport and Reykjavik town centre many travellers and tourists stop off before their flight. The ultimate relaxation before your flight wouldn’t you say? 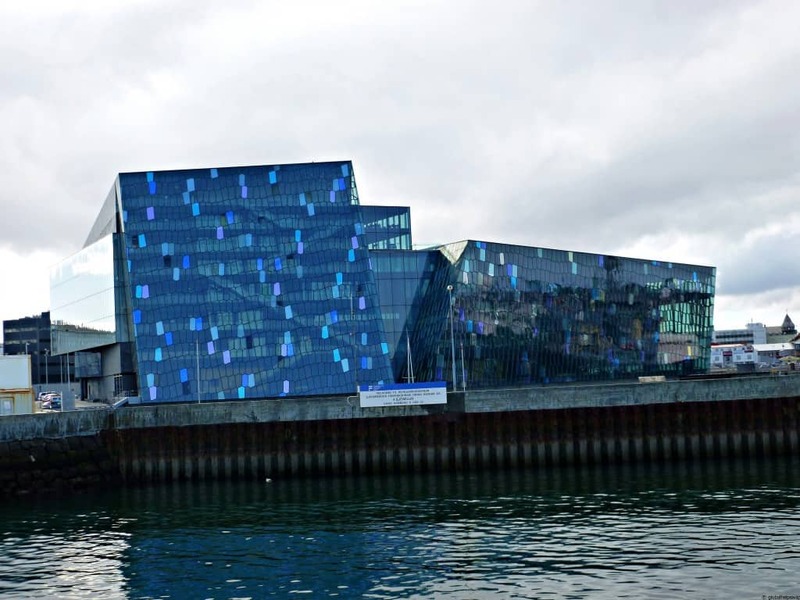 For such a small city Reykjavik surprisingly has many things to see and do. It is dubbed the “nightlife capital of the north” but at first glance you think to yourself what is all the fuss about? Most places are empty right up until around 23:00. Most Icelandics don’t go out to party until after midnight where bars will fill up suddenly. The main reason for this is like most things in Iceland, alcohol is expensive so most people stay at home drinking first before hitting the tiles to party. There are some amazing restaurants too but I will cover that elsewhere. 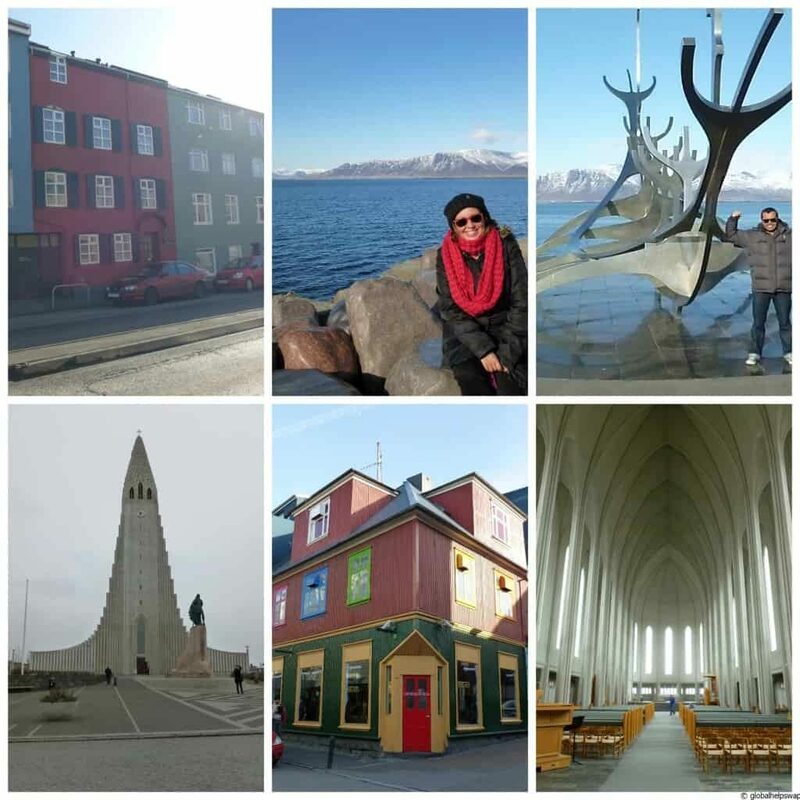 Reykjavik is the world’s most northern capital and has a population of 120,000. It is located right next to the ocean with mountains all around. It is one of the most beautiful cities I have visited. Because it’s so small you can walk around it easily and get to see all the highlights quickly. For me, one of the most refreshing things was seeing no multi-national chain stores and fast food outlets. Each shop had an individual feel to it with typical Scandinavian design. If it was not for the pesky climate, I would move there tomorrow! 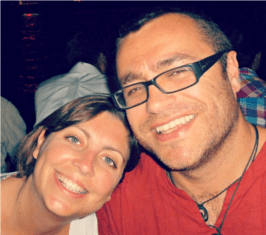 It may surprise you that we like taking tours considering we are always talking about going off the beaten track. When the tours are high quality they really can add to an experience of a country especially if it’s a short visit. 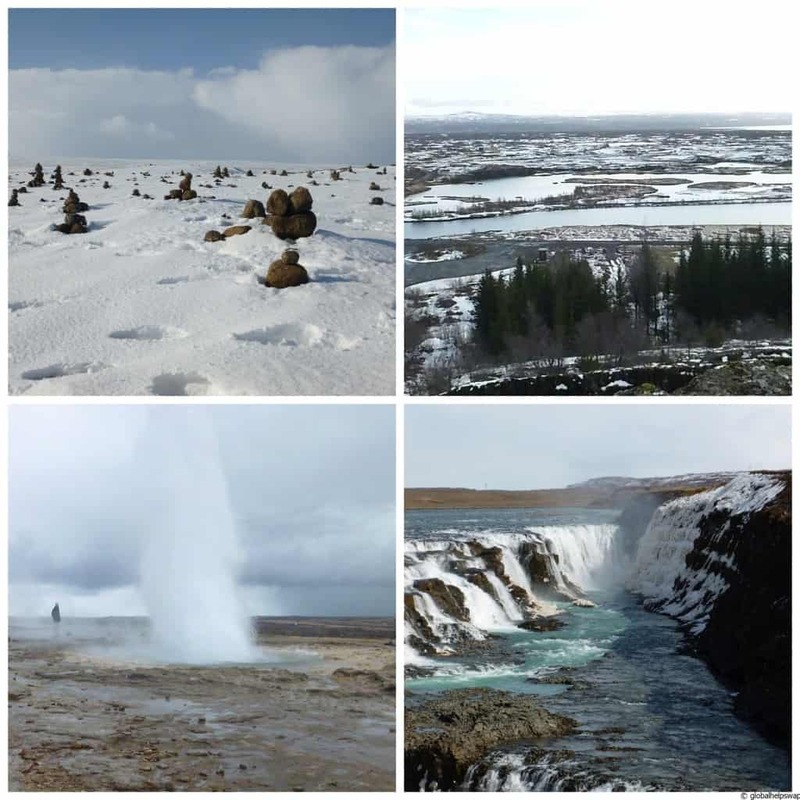 There are many tour companies that offer The Golden Circle tour. The tour visits some of Iceland’s most stunning sights. We got to see the hot spring Strokkur shoot a column of water up to 30 metres into the air every 4-8 minutes. You can actually feel the heat as you get closer. 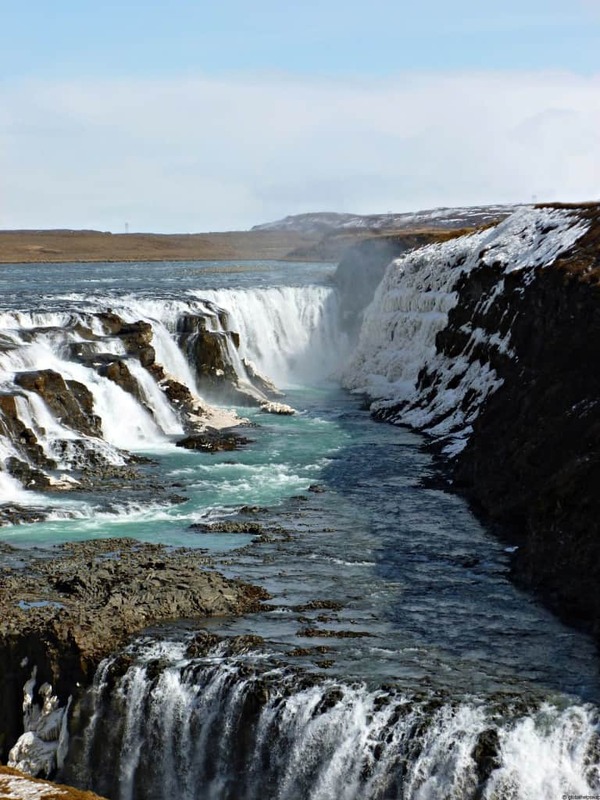 We also visited the magnificent Gullfoss (Golden Falls) waterfall which was stunning Our tour also included the historical and geological wonder that is Þingvellir National Park, where the American and Eurasian tectonic plates are pulling apart at a rate of a few centimetres per year. This was my favourite bit by far. I was actually touching the start of North America which ends in California!! Iceland is truly a land of fire and ice and it is quite humbling to see mother earth in close up action. 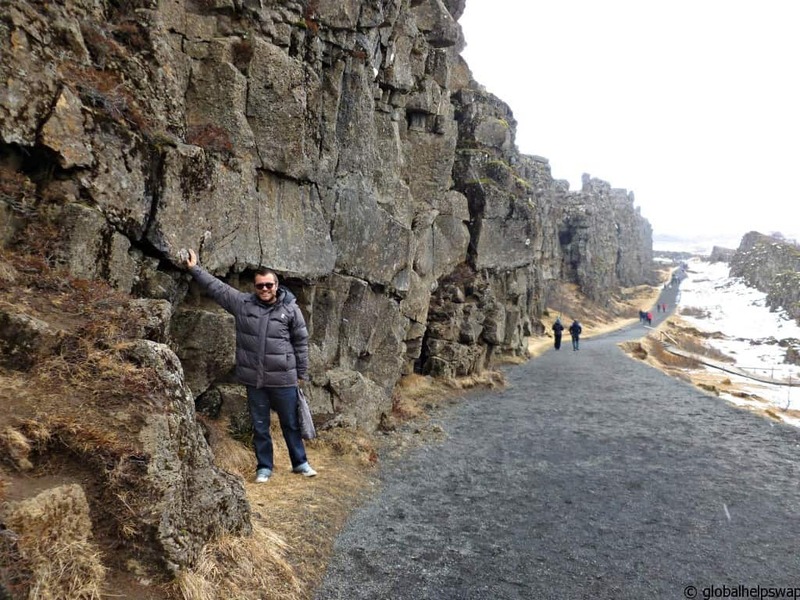 That’s me touching the American tectonic plate! This is my best shot! Sorry! When I mentioned to a friend that we were going to Iceland to go whale watching, he asked me “but I thought they eat whale meat in Iceland! ?” Which is what I thought. It turns out that less than 5% of local people eat whale meat and most of the meat eaten in Iceland is by tourists! Which is madness. 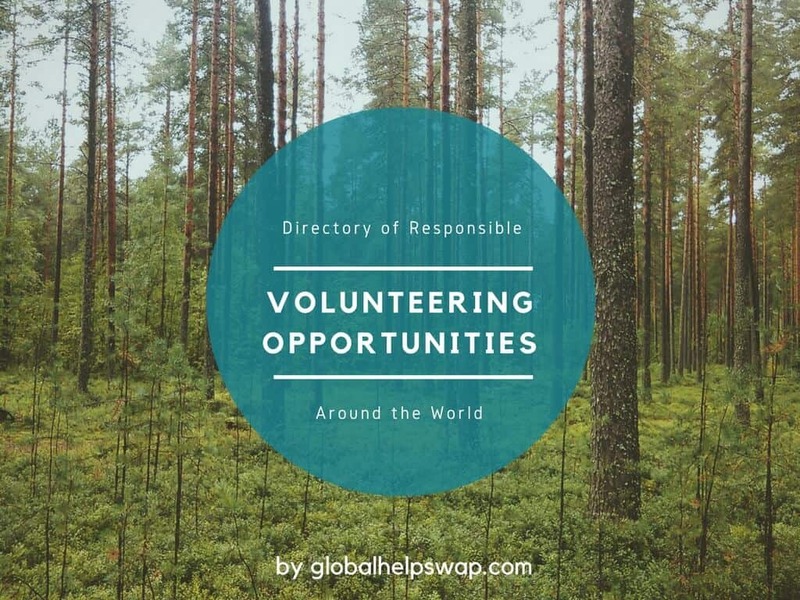 Please click on this link to find out more. 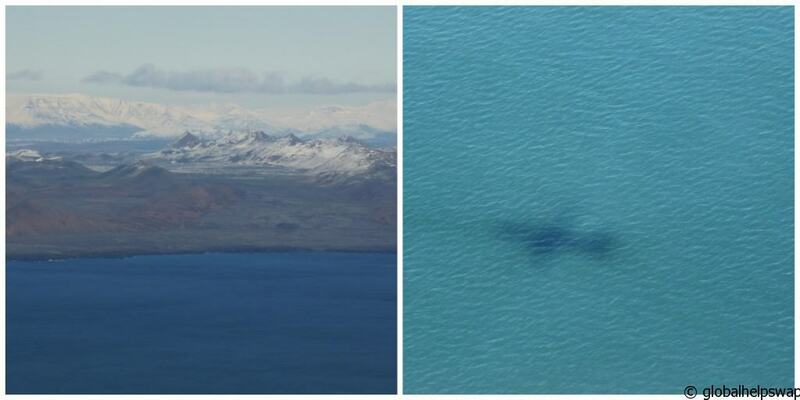 To do your bit for the whales go on a whale watching tour when you visit Iceland. The more people who go the better, so as to prove that it’s more profitable to keep the whales alive rather than slaughtering them for the tourists. Although the biggest reason to go on a whale watching trip is that it is absolutely fantastic. Just being close to these amazing animals was an honour and very thrilling. Unfortunately we did not see as many as they usually do but it was a Sunday and even whales need a lie in! It was so hard to take photos of them. 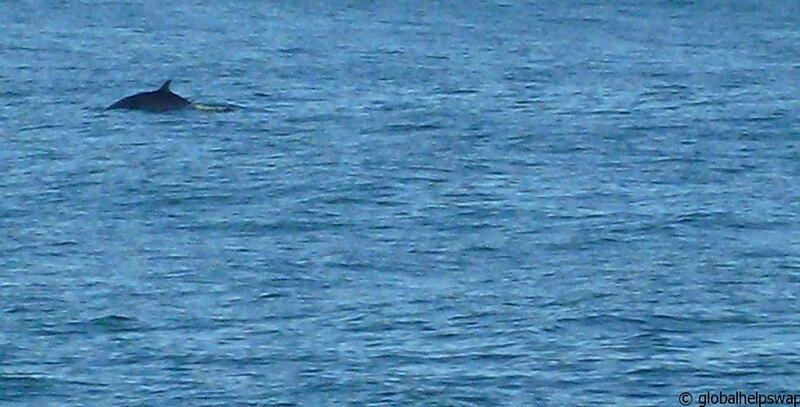 As soon as the spotter shouted “WHALE!!! !” you would look and it would have gone back under. Plus holding the camera in that biting wind was not easy. I take my hat off to all you wildlife photographers out there. As you surely must know by now, Karen & I are real foodies so we were pleasantly surprised at the quality of the food in Iceland. We were discovering Michelin quality restaurants everywhere we went. This is why it is so annoying that they feel the need to serve whale is some restaurants as their other produce is amazing. Going to high quality restaurants is the one activity that seemed cheaper than London (if you don’t have wine!). 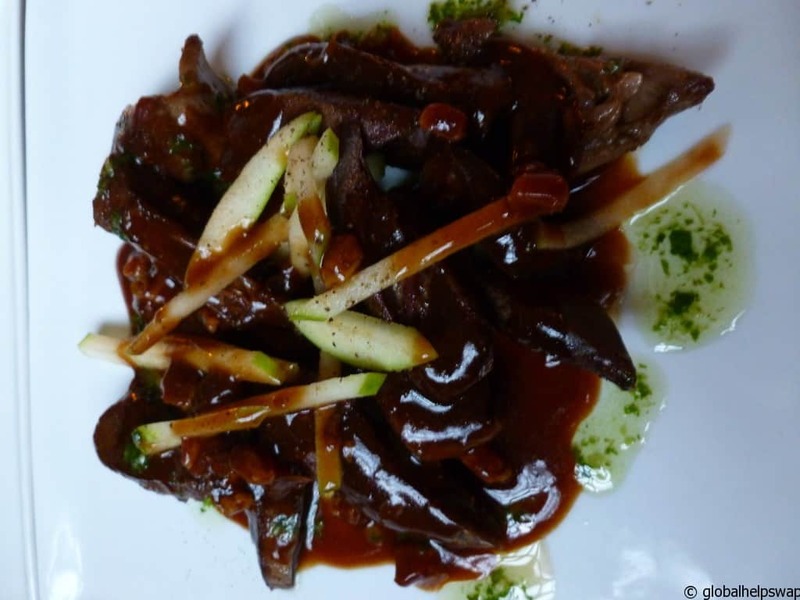 So if you do go to Iceland, go and discover some amazing restaurants but DON’T EAT THE WHALE MEAT. I hope this post encourages you to visit this amazing country. If you are in Europe it’s just a short flight to a completely different world. Have you been to Iceland? Do you agree or disagree with what we have said. Please feel free to leave a comment below. Very interesting ,great read and lovely photos . 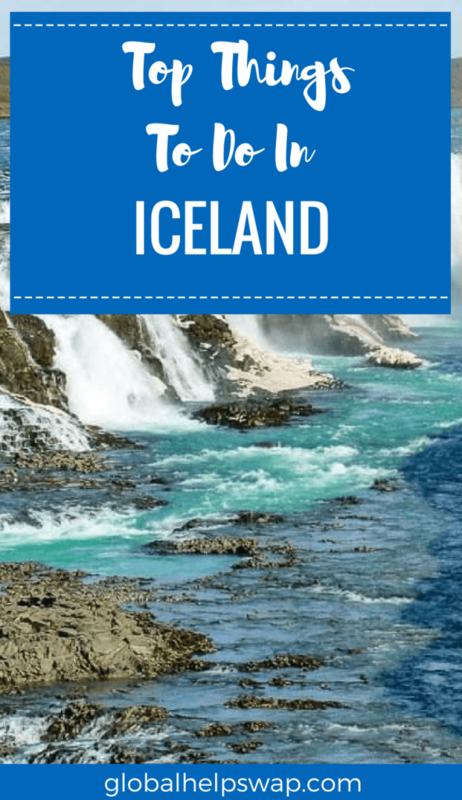 Iceland has been on my list of places to go for years! Since I was in high school, and the family I babysat for told me about it, I’ve dreamed of visiting. Now, I really have to get a move on on booking a trip there! 🙂 The landscapes are absolutely beautiful. Hi Erin! It’s amazing! If you fly with Iceland air from the states to Europe you get a free stop-over for at least a week. Thanks for the comment! Hi Dawn! Thanks for the comment. We agree, the Icelandics are super friendly. Thanks for sharing this information . It will really helpful for me when I will go to Iceland next month with my family.